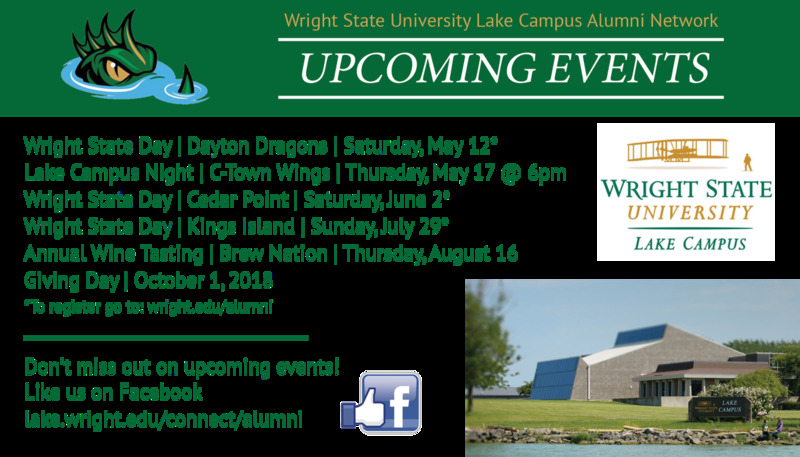 The Lake Campus Alumni Association provides Lake Campus Alumni, Wright State Alumni, and friends of the Lake Campus the opportunity to create a meaningful relationship with WSU and fellow graduates. The Lake Campus Alumni Association assists with recruitment and retention of students from the Lake Campus and beyond; participates in activities to promote, enliven, and support the interests of the Lake Campus Alumni Network; and develops and perpetuates greater involvement of alumni in the Lake Campus region. The Lake Campus Alumni Association hosts various fundraisers throughout the year to increase scholarship funds and to strengthen the overall campus experience. The Lake Campus Alumni Association is actively involved with Campus Housing Move-In Weekend, Welcome Wednesday’s, Student Orientation, in addition to various other campus events. The organization meets monthly at local restaurants throughout the area. If you are interested in learning more about this exciting organization, please contact Kip Wright at lakecampusnetwork@wrightstatealumni.com.